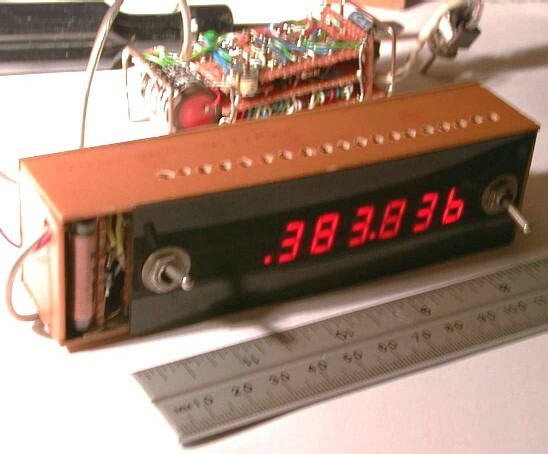 The counter is shown in the photo above with the matching panel mounting clock in the background, measuring a frequency of 384 KHz from the timing chain of the clock. The counter is encased in single-sided unetched PCB material, soldered together on the inside into a box shape. 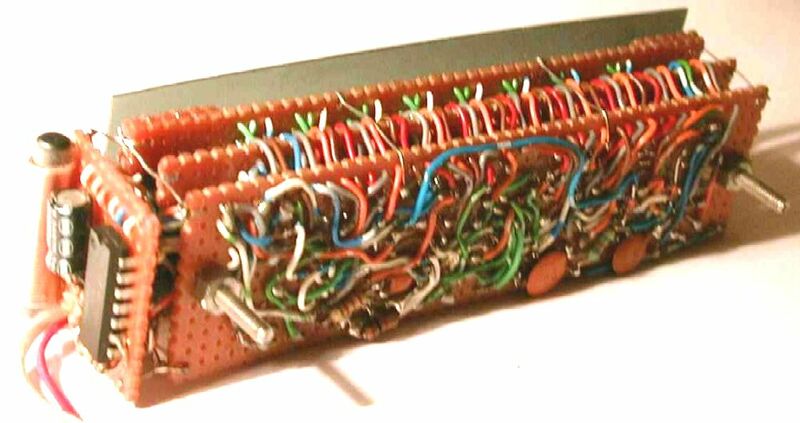 The nuts on the toggle switches are used to secure the counter inside the case of a radio tranceiver. I actually built this counter during my finals at university, it was a good break. At the left of the counter a coil can be seen - this is input filtering of the supply voltage, the idea being to prevent spurious signals from the frequency counter's timing chain from entering the host radio receiver. The circuit is built on a triple-decker vero-board arrangement (see right). Compact, but difficult to make repairs! On the left note the coil for supply line filtering. The bolts protruding from the rear circuit board are used to fix the assembly in it's PCB-material case, although its such a tight fit they're scarcely needed! CLICK HERE for an Adobe Acrobat .pdf file containing the three pages of circuit diagrams. Page 1: Counting chain, display decoders and 7-segment displays. Page 2: Timing chain and logic. Page 3: The placement of the chips on the boards, and pinouts. Thanks to Jonathan Kelly MW3KGQ who pointed out that the 4-bit ABCD inputs to the 4511 chips are incorrect on the bottom four 4511 chips on the page. The correct order for A B C D is pins 7 1 2 6 for ALL EIGHT chips, as in the top few on the diagram. Thanks Jonathan, well spotted!